A United Airlines employee suffered minor injures after a battery shipped in a bag exploded at O’Hare International Airport, officials said. The employee was taken to Resurrection Medical Center in fair-to-serious condition but officials said the employee sustained, “minor injuries”, according to a Chicago Fire Department spokesman. The explosion occurred as the employee was moving the bag and it burst open, hurting the man’s arm, fire officials said. Officials believe the incident was accidental and no criminal activity is suspected, officials said. An United Airlines spokeswoman said while flights are not being affected passengers may experience delays retrieving their bags. Transportation Security Administration officials said the item was checked in the C concourse of the airport. Police and FBI officials were on the scene investigating. The owner of the bag is being interview by law enforcement officials. 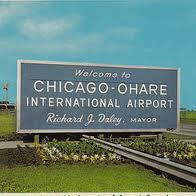 Officials said the bag was orginally checked in Houston, Texas and had a final destination at O’Hare.